The race is on for eligible entrants for the 2nd installment of the Limpopo Music Awards (LIMA). 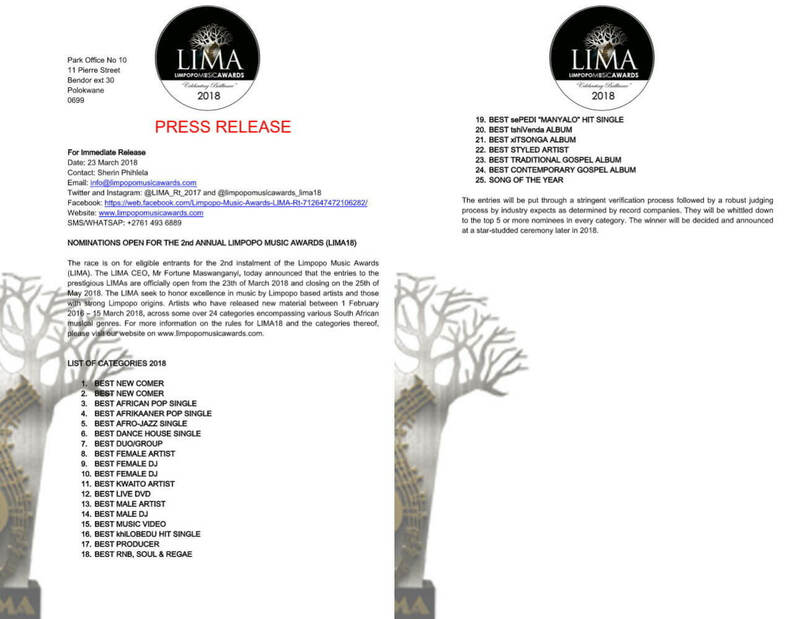 The LIMA CEO, Mr Fortune Maswanganyi, today announced that the entries to the prestigious LIMAs are officially open from the 23th of March 2018 and closing on the 25th of May 2018. The LIMA seek to honor excellence in music by Limpopo based artists and those with strong Limpopo origins. Artists who have released new material between 1 February 2016 – 15 March 2018, across some over 24 categories encompassing various South African musical genres. For more information on the rules for LIMA18 and the categories thereof, please visit our website on www.limpopomusicawards.com. The entries will be put through a stringent verification process followed by a robust judging process by industry expects as determined by record companies. They will be whittled down to the top 5 or more nominees in every category. The winner will be decided and announced at a star-studded ceremony later in 2018.